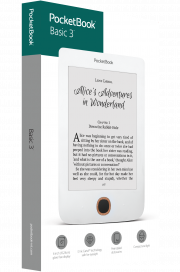 PocketBook Basic 3 - the new entry level e-reader with a 6-inch screen of the latest generation E Ink Carta™ and inbuilt Wi-Fi module for comfortable reading “on the go”. 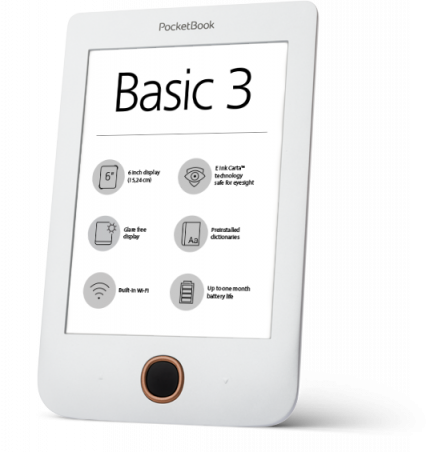 Intuitive user interface, reduced weight, good contrast of the screen, built-in dictionaries - all these features make the PocketBook Basic 3 ideal for those who appreciate simplicity and convenience. The optimal set of functions will allow to use the battery charge even more economical, which guarantees up to a month of reading without recharging. Due to the intuitive interface, the use of the e-reader will be easy even for those who make first steps in e-reading. All menu items are indicated by large icons. On the first screen, there is a shortcut of the currently read book. The library consists of convenient subsections, so-called collections. A user can manage “collections” according to personal criteria. In addition to 8 GB of internal memory, the reader has a slot for microSD cards, allowing to expand the memory up to 32 GB. With only 170 grams of weight PocketBook Basic 3 may be always at the user’s hand, offering to choose a books from the virtual library, which may contain up to 2,000 pieces. A pleasant bonus is 97 preinstalled free e-books in 14 languages, including 7 in German and 8 in English.